What is the relationship between condition monitoring and predictive maintenance? Industrial maintenance strategies have clearly shifted over the years from reactive to proactive approaches. 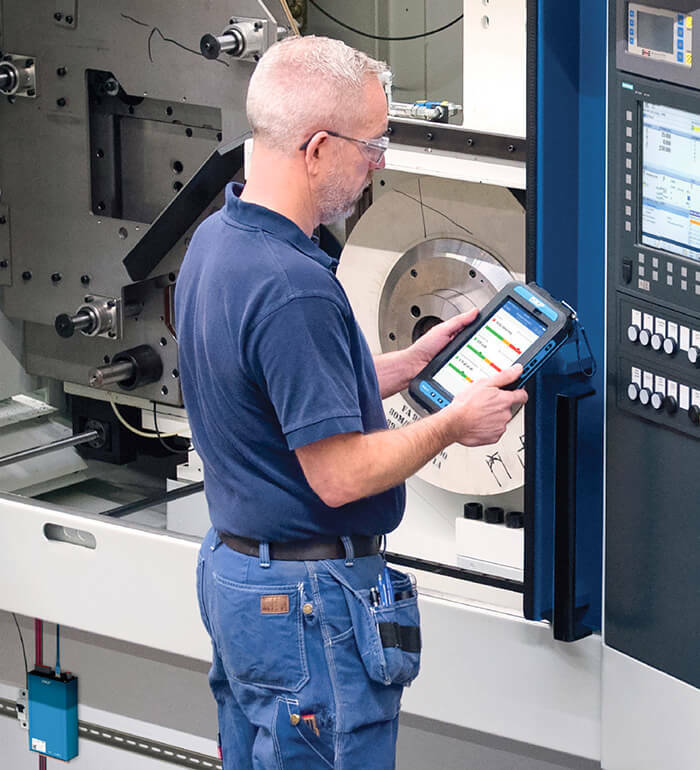 The historical strategy of preventive or time-based maintenance has largely given way to predictive and/or proactive maintenance, which is based on the condition of rotating equipment when in operation. This strategy is grounded in the principle that while machinery failure may be unpredictable, emerging failure is detectable. Condition monitoring technologies support predictive maintenance objectives by equipping operations with the surveillance tools to collect data reflecting the health of machinery and uncover faults for timely fixes before they can worsen. Why are pumps prime candidates for condition monitoring? When a pump fails without warning, the unplanned downtime, unanticipated deployment of maintenance staff, related costs and resulting lost productivity will disrupt any operation, particularly if the pump is serving as a critical asset. Advance warning of developing faults will always bea plus in realizing optimized pump productivity and reliability—not to mention supporting a safe work environment. What pump operating abnormalities can be detected? In any pump application, condition monitoring can detect imbalance, misalignment, bearing issues, impeller issues and cavitation, among others. Technologies can further help in flagging pumps that may not be running in their proper design state, within their expected operational curves and/or to their full potential. What condition monitoring technologies are in the toolbox? Options range from basic handheld or stand-alone data collectors to more sophisticated, connected and networked systems. Some devices and instruments focus on assessing the more significant physical operating parameters, such as vibration and temperature, while highly engineered systems at the other end of the spectrum can be configured to monitor and diagnose many more. The capabilities expand with integration into computerized maintenance management systems, the use of specialized software programs, and application modules and accessories targeting specific types of analysis. For especially critical pump applications, continuous on-line condition monitoring systems offer indispensable lifelines. On-line systems deliver up-to-the- minute information by looking at data 24/7 and storing scheduled and/or alarm data via permanently mounted sensors. The data is then transmitted via the hardwired or wireless system to a host computer running relevant software packages. How does a hardwired cabling for the connections and on-line condition monitoring system work? A hardwired system primarily consists of standard industrial sensors directly attached to monitored equipment, installation electronics. Typical units in the marketplace have been engineered with eight, 16 or 32 analog signal inputs and multiple digital inputs. These inputs are configurable for use to collect data on vibration, acceleration, velocity, displacement and temperature, among other parameters including tachometers. Individual warning and alarm levels controlled by machine speed or load can be set for each measurement point. Robust and programmable units can run on an existing local area network (LAN) or wide area network (WAN) and can network with computers, printers and servers, or over the internet. Systems can connect with cloud services for storing and sharing data and for accessing expert reporting and recommendations from a remote diagnostic services location. They can connect further with smartphones and tablets for real-time display of machine condition data. Promoting tracking, trending and analysis over time, substantial internal memory capabilities—up to 4 gigabytes (GB)—can store as much as a year’s worth of machine data and numerous event captures. As value-added safeguards, built-in auto-diagnostics often will be integrated to check all sensors, cabling and electronics for any faults, signal interruption, shorts or power failure. Should an issue be found, an alert would be sent automatically. Email and text notifications are part of the system. How much “real estate” is required for a hardwired system installation? 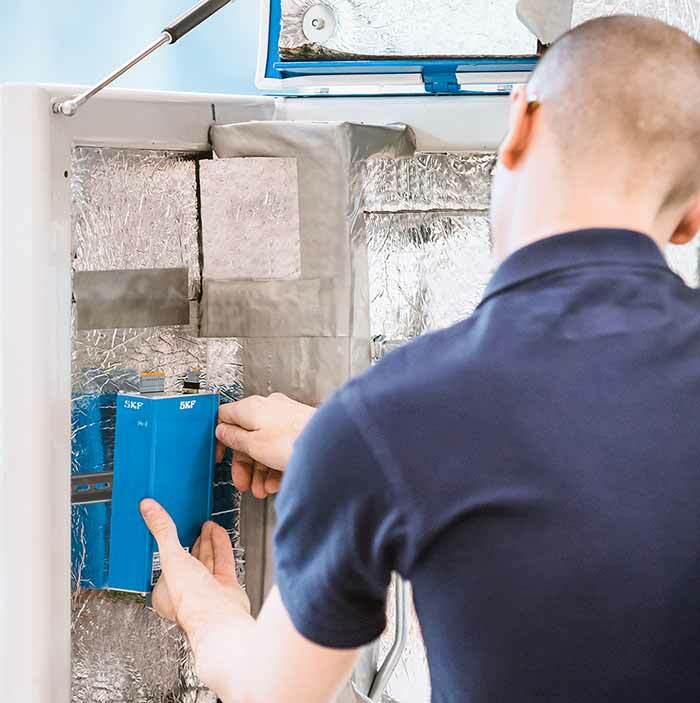 Some units have been designed to be purposely compact— no bigger than a paperback novel—and can fit easily into small spaces, even possibly using existing instrumentation cabinets. Units with a small footprint can provide a big assist in applications where monitoring instruments may need to be located as closely as possible to a pump targeted for monitoring. When would a wireless system be the more appropriate choice? For some machine surveillance jobs, setting up and running a hardwired system may be impractical, such as those requiring only temporary monitoring. Among other reasons to go wireless: fixed cabling may not be logistically possible, a permanent system cannot be justified on certain semi-critical or balance-of-plant machines, or costs associated with cabling and installation may be obstacles. In these instances, wireless condition monitoring devices offer a viable path forward. Wireless on-line monitoring can play several supporting roles. They can augment hardwired systems; keep a close and continuous watch on recurring “bad actors;” troubleshoot; supplement walk-around routes for maintenance staff; enable remote monitoring from afar; and/or provide “end of life” tracking of failing components, such as bearings. Wireless systems also can be relocated whenever and wherever needed without any logistical issues. Machines that operate in steady state and are general purpose or balance of plant equipment are ideal candidates for wireless sensors. How does a wireless on-line condition monitoring system work? 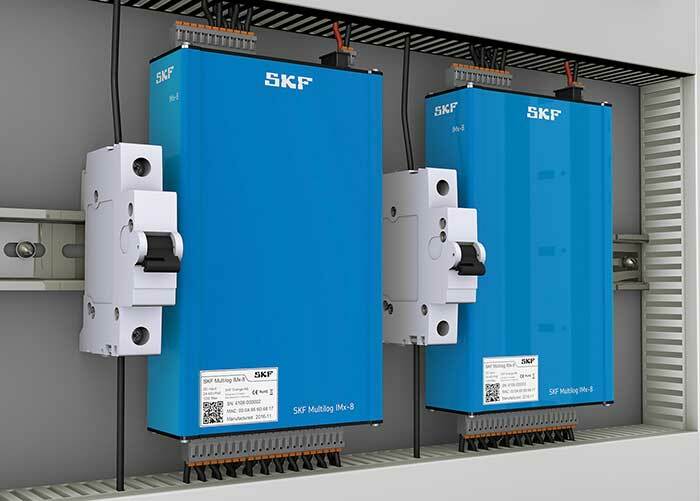 In self-contained and battery-powered systems, standard industrial current-powered sensors are mounted to the equipment earmarked for monitoring. Cabling is unnecessary. As one system example, eight-channel units have been engineered with four channels for vibration monitoring, four process inputs and one tachometer input. The sensors collect data on acceleration, velocity, displacement, temperature and bearing condition and then automatically—and wirelessly— upload and store the data for viewing, alarm evaluation and analysis using proprietary software. Timing for data collection can be tailored to the need. Systems can be programmed to “wake up” and take measurements, based on a fixed time interval, or can be externally activated on-demand by a programmable logic controller. What bottom-line benefits can on-line condition monitoring help deliver? Whether hardwired or wireless, on-line condition monitoring systems can pump up productivity by regularly performing appropriate inspections, guiding maintenance activities and allowing for fixes at the right time when and where needed, regardless of the calendar. As a result, operations can extend maintenance intervals for pumps and other rotating equipment, consolidate maintenance activities across the board, and reduce the many risks associated with unanticipated breakdowns and the disruptions in workflow that inevitably follow. Using these hardware and software technology platforms further allows for improving plant key performance indicators (KPIs), such as pump availability, reducing unplanned mechanical downtime and improving plant safety total incident rate. Greg Ziegler is strategic program manager at SKF USA Inc. He has more than 30 years of experience with machinery protection systems, on-line condition monitoring systems and sensor technologies for industrial applications. Prior to his current position, he managed the company’s condition monitoring product service business, leading a team of engineers for system installations, maintenance, training and mentoring customers. Contact Ziegler at 610-220-2667 or greg.ziegler@skf.com. For more information, visit www.skfusa.com.